Richard I’Anson talks about what to look for, how to prepare for travel and the shot, and taking great travel photographs. Year 2010 has been designated worldwide by United Nations as the International Year of Biodiversity. The term “biodiversity “ refers to the variety of all living things, be it plant or animal species. This National Museum of Singapore originated exhibition will look at the various depictions of 19th century Singapore, examining their meanings and representations. The various works will reveal the topography of the Singapore landscape in the 19th century with views of places such as the harbour, Singapore River, Fort Canning Hill, Raffles Place as well as depict the cosmopolitan trade town and Singapore’s rural scenes. Taking an approach that is both chronological and thematic, the exhibition will feature about 200 artefacts from the museum’s collection, a significant number of which were acquired in recent years and never before shown. There are workshops on landscape photography held in conjunction with The Image of Our Landscape exhibition. Find out more here. Shot for a couple months with an assortment of Canon DSLRs and EF lenses. Post production was achieved in Final Cut Pro 6 and Color was used for grading. Take part in this photography competition and stand to win great prizes! Simply capture images of your neighbourhood – be it the people, landscape or traditional customs and practices being carried out that mean something to you. It’s that simple! It’s amazing! 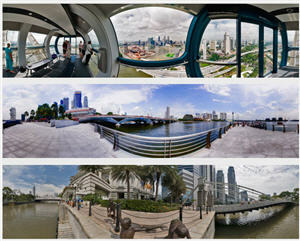 View Singapore in 360 degree panoramic photos!